The University of Leicester has announced that the skeleton found in Leicester on the site of Grey Friars church is that of Richard the Third "beyond reasonable doubt." I've always had a bit of a soft spot for Richard the Third; he was undoubtedly much maligned by the Tudors. Whether he had his two nephews killed I don't know. I find it strange that he is so perpetually vilified but King John, who definitely had his nephew killed and may well have killed him by his own hands, doesn't get much attention. Oooooh! What an AWESOME discovery! :-) I'll watch the video next time I'm online at home. 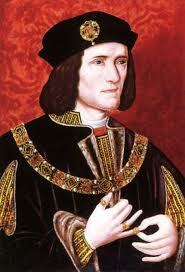 I think poor Richard gets vilified more because of Shakespeare's Richard III -- one of his more famous plays. Even people who haven't read the play are familiar with certain lines and have an image of that Richard in their heads. Yes, I think you're right about the influence of Shakespeare's Richard III. His remains will probably be reburied in Leicester Cathedral.